A massive commercial real estate development on the Tsuut’ina Nation, bordering Calgary city limits, will be named Taza, it was revealed during the recent Calgary Real Estate Forum. The development is on 1,200 acres of land and will eventually include 17 million square feet with a real estate value in the neighbourhood of $4.5 billion. William Briscoe, senior executive with Montreal-based Canderel MDC Development Management Inc., said the project, which will be officially launched in January, is one of the biggest First Nations developments in North America. Officials are in the process of finalizing the land-use plan and design guidelines. The specifics will be announced in January. Canderel and Tsuut’ina will also be looking at that time for development partners for the project. 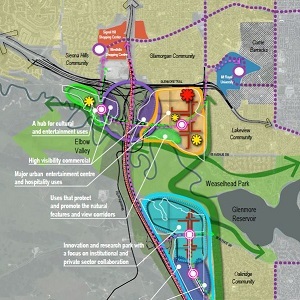 “Something amazing is coming,” Briscoe said of the partnership between Canderel and Tsuut’ina to develop the project in three phases that will include retail, hospitality and entertainment venues, an innovation and research campus, office space, health and community facilities, and parklands. The name Taza was chosen because it’s related to “amaze” in the Tsuut’ina language, Briscoe told the real estate forum. The developers want the project to reflect the culture and history of its location but to also be forward-looking. “From a Tsuut’ina perspective, this is more than just a real estate development. It’s bold. It’s ambitious and it’s also a plan for the future,” he said. The Tsuut’ina Nation encompasses about 75,000 acres bordering Calgary on its south and west side. “Our tag line we’ve come up with for marketing purposes Together at Tsuut’ina really means a lot to us with what we believe we’re doing,” said Briscoe. The proposed Taza development is a long-anticipated and critical commercial real estate puzzle piece of infrastructure in the greater Calgary region, said Michael Kehoe, an Alberta-based retail specialist with Fairfield Commercial Real Estate in Calgary. “On a micro-level, at the western edge of the southwest sector of the city, expectations are high on many levels beyond the mere delivery of goods and services to consumers in an underserved part of the city,” he said. From a retail standpoint, the project has a high probability of success if the development is planned and constructed to a high standard of finish and colour schemes with materials integrating the natural landscape and traditional First Nation local themes like the buffalo, added Kehoe. He said the concepts of place-making, pedestrian orientation, building in the public realm and connectivity to the adjacent communities are all important ones for a project of this scale. “I am hopeful that this project will incorporate and embrace the rich cultural symbolism that the First Nation can tap into,” Kehoe explained. The three major commercial developments on Tsuut’ina land will be fed by traffic flowing along the approximately 10 kilometres of the future southwest Ring Road extension that will pass through Tsuut’ina. The Ring Road creates access to the project and created the opportunity for it to move forward. There are three distinct villages – Taza Park, Taza Crossing and Taza Exchange (link will open a PDF map of the development). Taza Park is between 37th Street and west of Sarcee Trail and will complement the success of the Grey Eagle Resort and Casino. The vision is for an entertainment, hospitality and retail area. Taza Crossing will be located east of the Ring Road and west of the Oakridge community, and stretching from just south of Weaselhead Park to Southland Drive. This area will focus on health, wellness and innovation. A campus is expected to be built in this village. There will also be mixed-uses for the area, including rental units. Taza Exchange will be located directly south of Bullhead Road and north of Fish Creek Park and will support a major regional retail and commercial centre. Canderel was founded in 1975 by Jonathan Wener. The real estate investment, development and management company has its headquarters in Montreal and regional offices in Ottawa, Toronto, Calgary, Edmonton and Vancouver.